I have always loved the Fall, but I'll admit I took it for granted year after year. Only after living in Phoenix, Arizona for nearly 10 years did I really appreciate the joy of a majestic Fall season. In Phoenix they joke that there are only two seasons; Hot and Hotter! Although we loved living in Phoenix, we soon missed the blazing beauty of the Autumn leaves. Even driving on the highways you can't help but be struck by Fall's gorgeous hues. The bright yellows, fiery reds, and deep rust tones create a stunning landscape against cool, crisp, sunny skies. I love outdoor activities with my dogs in every season. Each season is special, with it's own brand of fun things to do with your pet unique to that season. Fall is one of the best times to embark on outdoor fun activities and adventures with dogs! The weather is cooler and the Summer crowds have thinned out. As October approaches we start thinking about Pumpkins, Hiking & Biking in cool weather, Fall Festivals & Costume Parades, Apple Picking, Corn Mazes, Fall Foliage, and Hay Rides! So much FUN and bonding to be had with our pets during the Fall season! 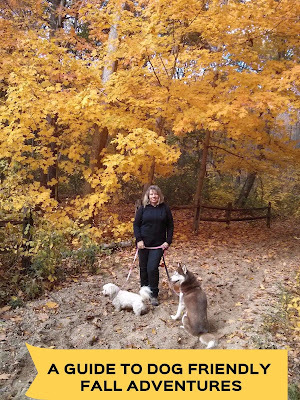 Here's a list of some great Fall activities to do with dogs. Plan your Fall adventures now before the season of Autumn beauty is gone! Icy and Phoebe love outdoor Fall activities and Halloween treats! Be ready for outdoor Fall activities with dogs by having the right gear! For all that outdoor fun with the dog, you want to make sure your dog is comfortable and safe! The two activities I look forward to the most with our dogs are hiking and bike riding. We hike and bike in Summer, but heat and humidity often makes us keep hiking and biking trips with the dogs short. Not so in the Fall, here's when we go all out! Bicycle riding with your dog is a great activity, but you should do it safely. Dogs have a habit of getting too close to the wheels of the bicycle or crossing out in front of the bike. To avoid an accident I bought a Bicycle Leash for Icy. A bike leash for dogs keeps your dog next to the bike and away from the wheels! I use the Walky Dog Plus bike leash, but there are a few others on the market. I couldn't find dog bike leashes in bicycle stores (weird, right?! ), but a Google search pulled up several. Walmart has a couple of them in their online store as well. Icy gets so excited when she see's my bicycle come out! Icy and I can usually bike ride from early Fall through December in the Northeast. In this video you can see how the bike leash keeps her at a safe distance from the bicycle. 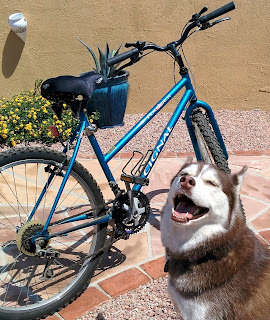 Bike riding with your dog is not only a total blast, it has health benefits for both of you! Need more reasons to bike ride with dogs? Here are 6 Reasons To Bike Ride With Your Dog! A bicycle basket made specifically for small dogs or other small pets! We've done so much awesome hiking with our dogs, from Sedona, Arizona to Montauk, Long Island with tons of places in between! I have to say, hiking is probably my favorite activity to do with the dogs. I love to get out and explore nature with them. It's a great activity for the 4 of us to do together. Although Icy and Phoebe are active at different levels, hiking is something they can easily do together. If Icy and my husband forge ahead, it's no big deal to stop and wait for Phoebe and I to catch up. When I think about my dogs being safe and comfortable during outdoor Fall activities, the first thing I think about is clothing and outerwear. Being a Siberian Husky, Icy pretty much never needs dog apparel of any kind! As soon as Fall weather arrives however, Phoebe gets chilly. I always have to break out a sweater or jacket for her when the weather turns cool. I love shopping for Phoebe, it's so much fun! They have the cutest clothing for dogs, especially for smaller dogs. 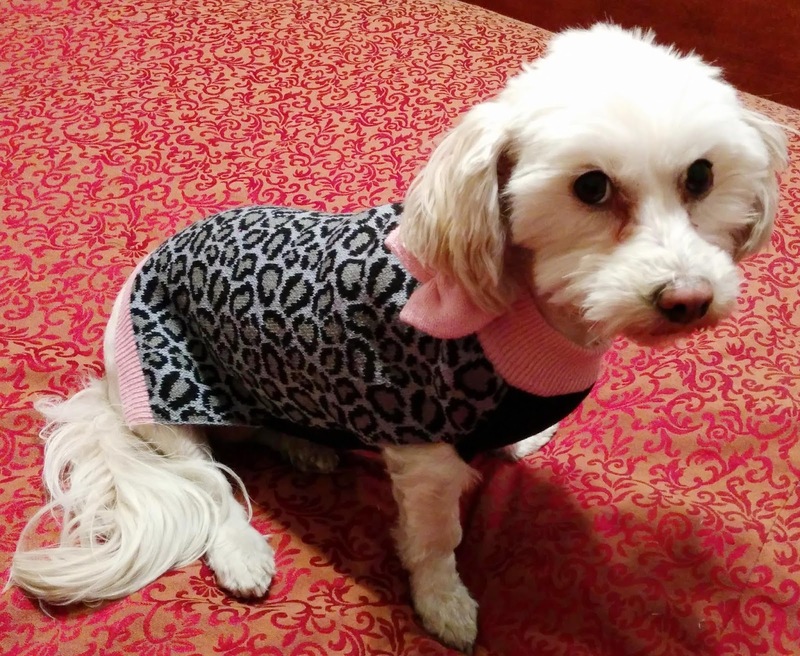 Phoebe in her Cheeta print sweater - I love the pink bow! 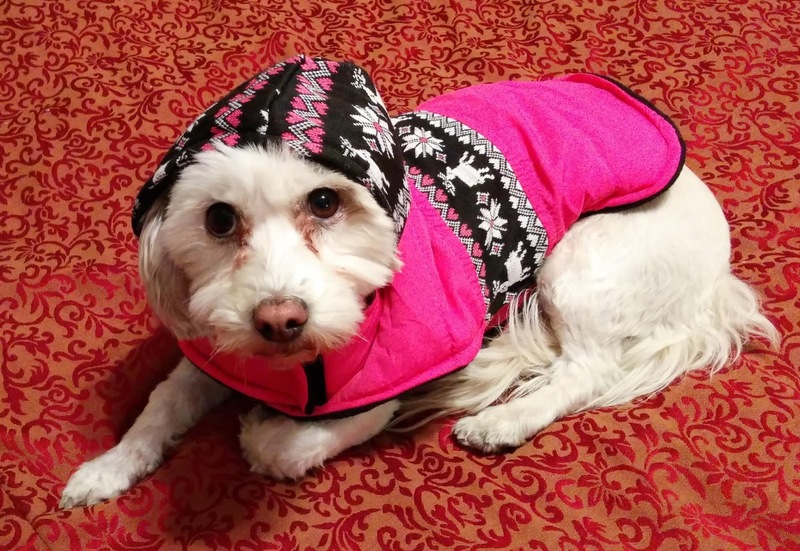 For cold Fall mornings, or if there's a chance of rain, your pooch might need a waterproof dog coat like this one. I love the adorable wool hood on this jacket! When we go on longer hikes, I often use a dog backpack for Icy. It helps with carrying gear like water bottles, snacks, bowls, and waste bags. It also helps curtail her pulling on leash. Many dogs pull on their leash. Using a backpack is one way some trainers recommend to reduce the pulling. Be sure to check with a trainer or pet store staff on how much weight is appropriate for your dog to carry in the pack, if any. You don't want to put more than approximately 10% of the dogs weight in a dog's backpack. We often use a backpack for icy when we go on hikes. It helps keep her from pulling like the sled dog that she is! She can carry her water bowl, water, and snacks allowing us to hike hands-free! Some dogs may require less weight or none at all in a backpack. Check with your Veterinarian before using a weighted backpack on your dog for the first time. Here are more tips to get your dog to Stop Pulling On Leash. The stylish Everest Dog Pack by Pet Life shown here is waterproof and has reflective strips on the sides for safety. You may not consider reflective safety strips when hiking, but more than once we've found ourselves still hiking after the sun has set. Sunset in the Arizona desert is often when coyotes (and other animals) start hunting. We could hear the howling - yikes!! A dog backpack can not only carry some of your dog supplies & gear, it can help discourage leash pulling. Make sure you bring plenty of water on any outing with your dogs! Remember to bring along portable bowls and a water bottle. Fall is actually prime season for Fleas and Ticks! Be sure to protect your dog with Flea & Tick control. Bravecto provides up to 12 weeks protection from ticks and fleas in a tasty chew. Note: Always Consult your Vet before you begin using any flea/tick product. Fall is prime Tick and Flea season! Bravecto protects against ticks & fleas for up to 12 weeks! If you plan to take your dog near beaches, lakes, ponds, pools. or out on a boat you may want to consider a Life Jacket for Dogs. A life jacket is a great safety option for dogs around water, especially if your dog is unfamiliar with the area, isn't a strong swimmer, or if he'll be out on a boat. This Kurgo Surf 'n Turf life vest doubles as a life vest or rain coat. It has 2 handles to help get your dog in and out of the water, reflective trim, and 2 metal D-rings for leash connections. The flotation layer can be removed so that the waterproof shell can be used as a raincoat! If outdoor Fall adventures with your dog take you anywhere near water, consider a dog Life Jacket for pet safety. If your Fall adventure with your dog involves a car ride or a weekend getaway, consider a Dog Carrier or Pet Crate and a Pet Safety Harness for the car. There are SO many beautiful and versatile pet carriers to choose from these days. Pet carriers come in lots of shapes and sizes, some models even have wheels. A carrier or crate is a great way to keep your pet safe and secure while riding in the car or at the airport. If your Fall adventure involves taking your dog or cat on an airplane, here is some information you should know; Tips For Air Travel With Pets. Phoebe loves her Sherpa pet carrier! I actually leave it open for her on the floor in my office so she can nap right next to me. Outdoor Fall adventures with the dogs usually come with mud, sand, or dirt! For all those great outdoor Fall adventures with your pup, make sure you protect your car seats with a Car Seat Cover like the one shown here from Kurgo! They come in all sizes to fit pretty much any vehicle you've got. 4Knines makes great car seats too. Outdoor adventures with dogs almost always involve mud, sand and dirt! Investing in a quality seat cover like this one from Kurgo is a great idea. Even if you have a car seat cover don't forget to bring along Pet Wipes and a Towel or Paper Toweling. You'll probably want to get the dirt off their paws before going back into the house after a day of outdoor fun & adventure! I always have pet wipes in the car and in my backpack, you just never know what your dog will roll in, step in, or swim in! If there's anything massively stinky to roll in, my dogs are sure to find it! One of the things I can't do without on any of our adventures with the dogs is a First Aid Kit. I can't tell you how many times we've traveled with our dogs or gone on long day trips and needed the First Aid Kit! It's essential to get a pet first aid kit, or assemble one yourself. I'll never forget the time Icy cut her paw open on broken glass on her last potty break of the day. It was at a hotel in Albuquerque, around 11pm. No Veterinarian's were available and our first aid kit literally saved us! Paw pads bleed a lot more than I expected! A First Aid Kit is essential for outdoor adventures with dogs. The first aid kit pictured here is a 50 piece kit that folds up to fit into a backpack or glove compartment. It includes a guide with instructions on how to assist a pet with minor medical emergencies. We never home without a first aid kit! We always have antibiotic ointment in our Pet First Aid Kit, it's essential to prevent infection if our dogs cut themselves. I recently discovered Zymox Topical Cream with .5% Hydrocortisone. This cream is made specifically for pets and is used for wound care, hot spots, and skin infections. I love all their pet products, especially Zymox Oratene Brushless Pet Oral Care products and Zymox Itch Relief Shampoo. Anther fun Fall activity is to head for your favorite dog friendly cafe for a mug of steaming hot spiced apple cider. While you relax and enjoy that delicious traditional Fall beverage, your dog can enjoy a special chew stick or her favorite toy right beside you. 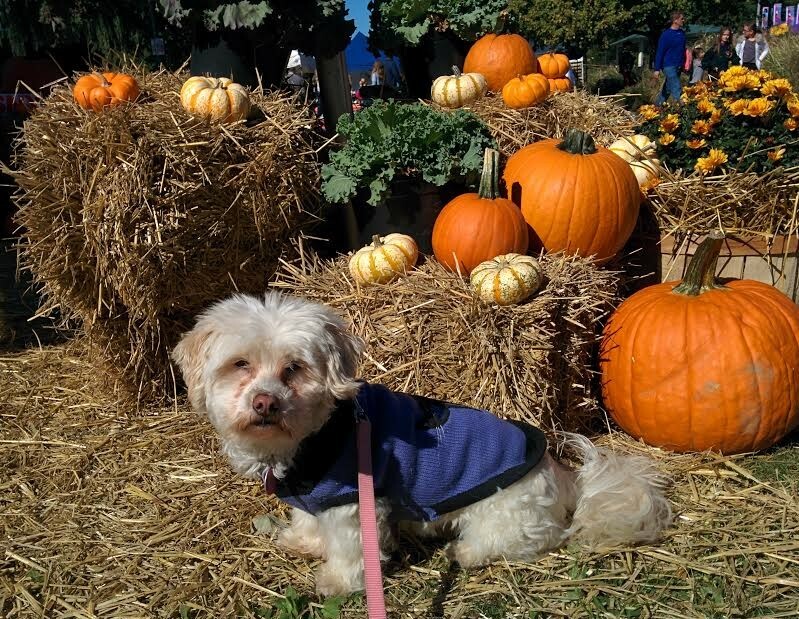 Pumpkin picking is a perennial Fall favorite, so look for a dog friendly farm and take your dog pumpkin picking! I love taking pictures of my dogs out in the field among the bright orange pumpkins, the photos come out so pretty with all that Fall color. Rich Fall color brings so much warmth to a photo. One thing we look forward to all year in our area are the Fall Festivals and Pet Costume Parades. It's so much fun to see all the dogs out and about, trotting alongside their family enjoying the festivities. A Pet Costume parade is always fun. Some people are really clever in the costumes they create for their pets! It's so inspiring. 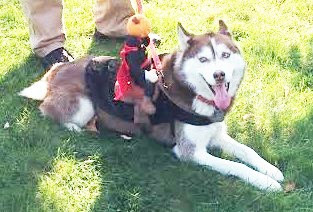 Icy marched in our town's Pet Halloween Costume parade looking BOO-tiful in her Headless Horseman costume! I'm sure this year's hottest Pet Halloween Costumes will be super heroes again, like Wonder Woman for the girls and Spider Man or Super Man for the boys. Do you dress your pet up for Halloween? What will your dog, cat, lizard, or other pet be for Halloween this year? Tell us in the comments! I love the little skirt on this Wonder Woman costume, it's so cute! You don't even have to leave your own yard to enjoy the beauty of Fall with your pet. Rake up the leaves in your yard and let your dog or cat play in them! Throw his favorite ball or toy into the pile and watch him have fun digging and jumping through the leaves to retrieve the prize. So what if you have to rake the leaves up again, it's worth it! Once again, I'll be searching for a dog friendly Hay Ride and Corn Maze! I was unsuccessful last year. I'm excited to see more Fall themed pet treats this year, like Greenies Pumpkin Spice flavored Dental Chews for Dogs! No reason why our pets shouldn't enjoy the flavors of the season, right? While you enjoy a mug of hot apple cider at an outdoor cafe, give your dog a pumpkin spice flavored treat to enjoy and celebrate Fall together! Pumpkin Spice flavor dental treats. Our pets should enjoy the flavors of the Fall season too! If you have the time and energy, you can make your own dog treats with Fall themed flavors like pumpkin, apple, or pear. I take advantage of all those freshly picked pumpkins of Fall. I add some pure pumpkin to my dogs' food each morning to give them the health benefits of pumpkin all year round. In the Fall I make my own pumpkin mush for them from the fresh pumpkins we bring home. If you've never made fresh pumpkin mush yourself, you'd be surprised at how much pumpkin mush even a very small pumpkin can yield! Phoebe, surrounded by beautiful pumpkins at our town's Fall Festival! 🐾 After removing the seeds inside, I cut a fresh pumpkin into large chunks and boil until the pieces are soft. 🐾 Then I peel off the outer skin (Skin comes off easily after boiling) and mash it all up in a bowl. You can puree it in a blender if you prefer. 🐾 Cooked pumpkin freezes well so it should last a couple of months in the freezer. Always check with your Veterinarian before introducing any new food into your pet's diet. Never feed raw pumpkin to your pet, raw pumpkin can make them sick. We are looking forward to going walking again now that the weather is cooler. Same here, Alasandra, cool weather is great for longer walks & hikes! I love this time of year but want to come up to your area one fall and marvel at the colors! The boys love the pumpkin spice Greenies. You should definitely take a trip up here, the Autumn color is so amazing! I've got a guest room with your name on it my friend! Fall is my favorite time of year, so many fun things to do! Bike riding with your dog looks like so much fun! We used to hike a lot too and I miss that. Most of the trails around here are just too busy to take Luke since he's so fearful of strangers. So we stick closer to home and walk in our own woods which is still fun! I've been baking pumpkin treats with frozen puree from last year's pumpkins (we have a big chest freezer which doesn't get opened a lot so it lasts quite long). I'll do the same with this year's pumpkins, but I grew my own and they're kind of late this year. I also hope to make some apple treats too, using apples from our own trees! Hope you find that hay ride! I love the Fall so much, sometimes I can't take my eyes off all the beautiful colors. It's so cool that you've grown your own pumpkins and made things out of it! That must be so healthy, pumpkin is such a beneficial food. Fall is definitely my favorite season. I learned years ago (with my dog in high school) that fleas are still an issue in fall. I think most people still think of it as a summer problem, but you are right, they are still around waiting to cause problems in fall. I love Fall, it's such great weather for outdoor activities! Fleas & ticks are absolutely still an issue in the Fall, in fact ticks are extremely active in Fall. Dexter loves fall and spring. Not too hot, lots of long walks and sniffs. Man, I so wish I was able to find a bike basket that would fit Dexter. We have a trailer, but it can be larger and cumbersome. Maybe goal for 2018! We love the Fall and Spring too, but more so the Fall since it's really cool and doesn't rain as much. I love the idea of a bike basket that a small dog can fit in. I've seen the trailers with dogs in them, they are so cute but you have to be so careful if you take them into the street. A park with a nice wide path is the best. I am thinking of getting a pet stroller so I can walk to our vets instead of getting a cab every time. I don't drive and the cats refuse to ride pillion on the bike!! You miss fall? You might find it odd here, we have 'some' leaves drop but being temperate so much stays in full leaf (weird) AND we only get snow once every 30 years LOL!! I think a pet stroller is a great idea for the kitties. I'm sure they would not appreciate riding on the bike! I didn't realize that NZ had such temperate weather and that it rarely ever snows. I love AZ as well, but I did miss all this Fall beauty. I appreciate it so much more now. Fall is the best! For a few years when I was a teenager, we lived in desert climates. I remember being bored by so many continuous days of sunshine. Now I live someplace that has more rainy days than sunny days, and I still like it! Seasons make life so much more interesting, although I would like winters to be a little shorter or warmer. I think seasons make things more interesting, and beautiful too! I can't stop staring at the blazing yellow tree outside our bathroom window, it's spectacular. I got sick of the sunshine too after about 2 years in Phoenix - it's too much! I'm glad you enjoyed it, thanks! These are all the products it took me a long time to get, or products that I still want very much. They make things more comfortable, easier, and safer too. Those dog sweaters are adorable. I want one for Mr. N! We're taking Mr. N to a harvest festival this weekend. Aren't they the cutest!? I go nuts w/ doggie fashion, especially for Phoebe. She actually needs sweaters & coats so I can fully justify any purchase, LOL! That must be so cute seeing Layla love riding the buses, LOL! You are lucky she enjoys it and doesn't fight you about getting on the bus, that is so great, you can take her anywhere. Enjoy your Fall adventures! I look forward to seeing photos of your adventures on the blog. I love the fall, too. It's my favorite season. It must be so much fun to share it with Phoebe and Icy. They're the perfect companions. Isn't it just beautiful here in NY with all the Fall foliage? We will be taking some trips up North to see more foliage, that will be just beautiful. Icy & Phoebe love taking road trips and finding new places, especially in woods of any kind - my little nature girls! This is the first time in a long time I've been able to enjoy Fall, since my retirement. Now, I need to get more active! I'm so glad you are enjoying Fall, take full advantage of the Autumn beauty! I can't stay indoors w/ this great weather and beautiful Fall foliage, I just want to get out and GO! We love fall! It's the perfect weather for hiking and camping. 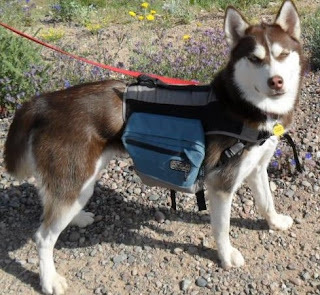 I actually just got a bikejoring harness for Boomer too! Can't wait to start biking with her now that it's not so crazy hot outside. Oh,and she had the same Halloween costume as Icy 2 years ago too! Fall is definitely the best time for hiking & camping, the weather is perfect and the foliage is gorgeous. I love my bike leash for Icy, it's the best exercise and so much fun for both of us. That's so funny that you had the same costume, LOL! I love that one because it's so easy and simple and it doesn't make Icy hot to wear it. It's perfect for her. I love the fall too, we had such a hot September, and warm October I don't think we'll get much fall color. I know if we move to Myrtle Beach I'll really miss it. And taking Dolly to the forest preserves to enjoy it. Thanks for the great tips! I know right!? September was ridiculously hot & HUMID all over the central & Eastern US. Ugh, I couldn't wait for the beautiful cool, crisp Fall weather. It's finally here! Are you moving to Myrtle Beach?? I didn't know that! It's beautiful there, especially the beach areas. I love the fall! We have such a short one here in Utah, so we try to take advantage of the cool weather and beautiful colors before they are gone! I use backpacks all year though! I love it too! The cool, crisp air and all the beautiful foliage is wonderful, it's too bad it doesn't last long enough! What a terrific post! We are waiting for cooler weather to get out and explore more of our new surroundings. We have found some pawsome dog-friendly trails but it is waaaay too hot for Bentley (and us). You have convinced me to get a pumpkin this year for the boys. Thank you hopping on the Pet Parade!